This company was started as a hobby in 1973 when Joan and Cal Clark finished a restoration of their Corvair and found people asking for the parts they had obtained over the months for their car. 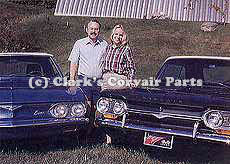 They put 5 shelf units in their apartment and listed 150 Corvair parts in a small "catalog". Within 2 years Joan had quit her secretarial job and soon after Cal stopped teaching biology, general science and Drivers Ed.